NASA's Space Amateur Radio Experiment is connecting students and ham radio operators on Earth with astronauts in Earth orbit. August 21, 2000 -- For most amateur radio operators, it is the thrill of a lifetime to receive a "CQ", or general call, from an astronaut in space. But for some, like former astronaut Dr. Owen K. Garriott, call sign W5LFL, the thrill comes from receiving a response from "hams" down on Earth. Garriott, who has been an amateur radio operator for over 40 years, was the first astronaut to take a ham radio into space, pioneering the way for an increasingly well developed amateur radio space program. 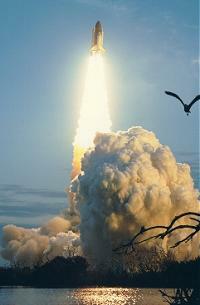 "It was my good fortune to take the first amateur radio into space on STS-9 in November 1983," Garriott said. "In my spare time only, I managed to hold up an antenna to the window and to talk to amateurs on Earth." This contact was the first communication between astronauts and people on the ground outside of "official" channels, which are usually reserved for presidents and heads of state. Hams, as amateur radio operators are often called, use radio transmitters and receivers to talk to other hams all over the globe, as well as to those in space. There are more than 1.5 million licensed hams worldwide, including more than 400,000 Americans. Every radio amateur must be licensed by the Federal Communications Commission (FCC). In order to obtain a license, a ham must pass an examination, which includes questions about radio theory, rules and regulations, and International Morse Code. There are three grades of licenses, each at progressively higher levels of proficiency: Technician, General and Amateur Extra. Any licensed ham can chat with the Shuttle. Once the examination is passed, the FCC issues the amateur operator's call letters. The first letter indicates nationality. In the United States, the first letters are A, K, N, or W.
Garriott had originally proposed the idea of taking a ham radio into space on his first space mission, Skylab 3, but was unable to due to timing and other complications. Ultimately, though, he persisted and was able to obtain permission to fly a small hand-held transmitter/receiver aboard the Space Shuttle Columbia. Left: This is U.S. Astronaut Owen K. Garriott - W5LFL - aboard the U.S. Space Shuttle Columbia STS-9. He is holding a Motorola two meter FM ham radio. "When in orbit over land, I could make a CQ, which is a general call, and see who responded," Garriott said. "I used a well-designed, hand-held antenna, known as a 'cavity antenna', which could be velcroed to the window. It was about 24 inches in diameter and looked somewhat like a large aluminum cake pan. The transceiver then connected to the antenna." In addition to the general calls, Garriott had made a few plans to send out a call to specific Earth-bound hams at prearranged times and dates. "I had specified particular times and frequencies beforehand," Garriott said. "Among others, I was able to speak with the Amateur Radio Club in my hometown of Enid, Oklahoma, with my mom, with Senator Goldwater, and with King Hussein, who was an avid ham." Since that first voyage into space, NASA has continued to see the usefulness of bringing ham radios into space, and astronauts have been able to speak to hams on earth on dozens of shuttle flights, as well as on the space station MIR. "There has been substantial amateur radio activity in space since I first brought one up," Garriott said. "There is now a program called SAREX that is allowing for more and more activity." The Space Amateur Radio EXperiment (SAREX) is a long-running program to use amateur radio equipment on board the Space Shuttle to involve students in exchanging questions and answers with astronauts in orbit. Students in hundreds of different classrooms across the country are able to ask the astronauts questions about space flight and the experiments being conducted on the mission. It also allows for communication with amateur radio operators on the ground. SAREX is sponsored jointly by the American Radio Relay League (ARRL), the Radio Amateur Satellite Corporation (AMSAT) and NASA. Students and amateur radio operators can attempt to contact astronauts flying on a SAREX mission through voice, packet (computer) radio, or television, depending on what equipment is flying on the shuttle and on what equipment is available on the ground. According to the ARRL web site, SAREX missions are planned to begin again during the fall of 2000, and schools can apply to be contacted during the space flight. In addition, in 1997, NASA approved plans to include amateur radio equipment as part of the payload of the International Space Station (Amateur Radio on the International Space Station or ARISS). Since astronauts will have more time in space while on the ISS, more opportunities for ham radio contacts will exist. "Shannon Lucid used a ham radio while on MIR," said Garriott. "NASA saw how using an amateur radio would be a good thing for astronauts to do in their spare time on the space station." Above: Onboard the Space Shuttle Endeavour, astronaut Linda M. Godwin (right) talks to students (left) via the Shuttle Amateur Radio Experiment (SAREX). 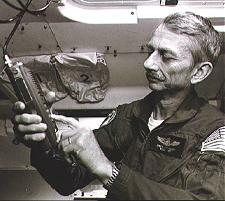 The payload commander, as well as several other STS-59 crew members spent some off-duty time using the amateur radio equipment to communicate with "hams" and students on Earth. And certainly hams on the ground are eager for contact with the astronauts. Specially designed shuttle "QSL" cards, which are postcards used by hams to confirm two-way contact or reception of a signal, are among the most prized in a ham's collection -- even to a king. Schools interested in learning more about SAREX and how it can work with their academic programs should visit the ARRL web page: http://www.arrl.org/sarex/sarexnew.html. Web Links Space Amateur Radio EXperiment - SAREX is a long-running program to use amateur radio equipment on board the Space Shuttle to involve students in exchanging questions and answers with astronauts in orbit.